In this blog post, I am going to talk about our IoT parking lot demo and the technology behind it. I will try to explain how to use Azure IoT Hub to send messages between Azure services and devices to achieve the same level of communication we had in our demo. I will also quickly try to explain all the different modules we used in our demo, but my samples will focus on Azure IoT Hub and how to easily send and receive messages. 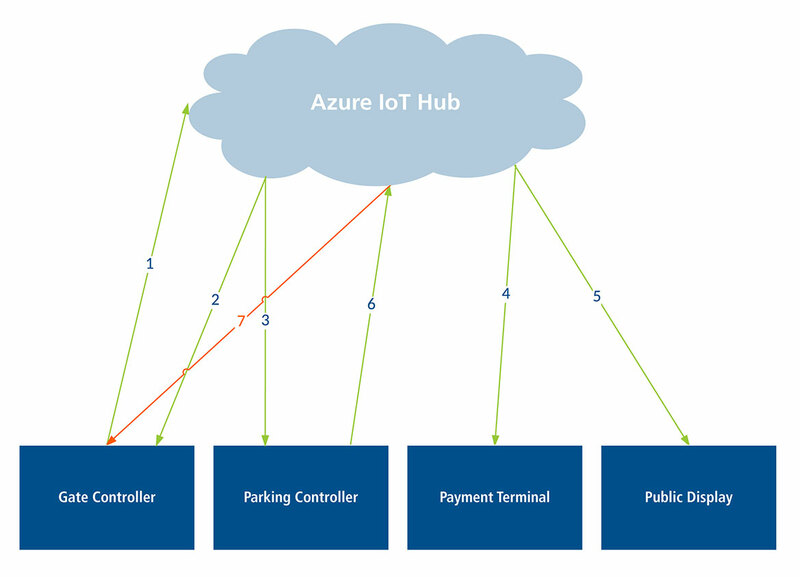 If you are interested in knowing more about Azure IoT Hub, you can check the details here. 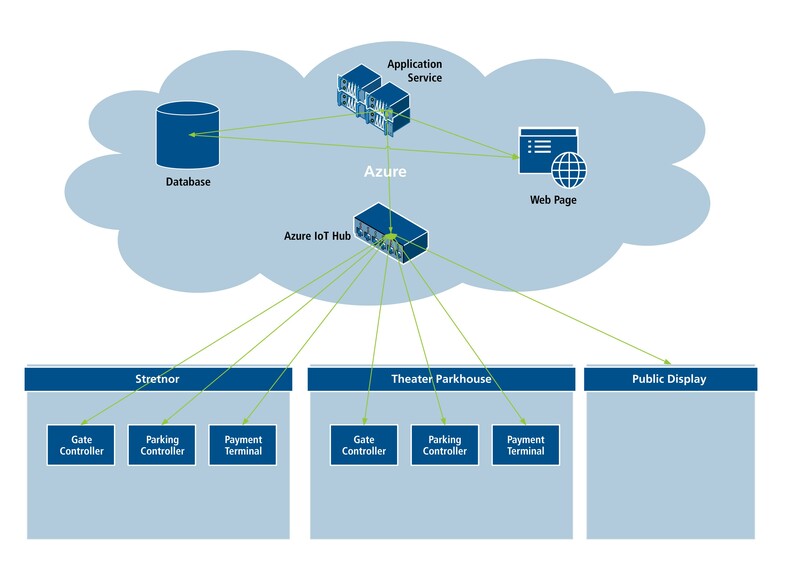 As you can see in the above image, all the communication messages go through the Azure IoT Hub to the application service that processes these messages. You can also see that we have a web page and database running in Azure but this blog post focuses only on the part about Azure IoT Hub. There are two basic events that trigger the flow of information between devices and IoT Hub. When a car arrives to the gate, the gate controller will scan the license plate and send a message to IoT Hub (1). After the application service verifies the data, it will send the message back to Gate Controller to open the gate (2). At the same time, a message is sent to the Parking Controller with the number of assigned parking spaces (3). The Parking Controller will start blinking the Red light indicating that the parking space is going to be occupied soon. The message is sent also to the Payment Terminal. This message includes the license plate number and time of arrival (4). At the same time, the Public Display receives the information about all the parking spaces in the area (5). When the car is parked at the parking space, the Parking Controller stops blinking the Red light and sends a message to the IoT Hub indicating that car is parked (6). At the same time, the Gate Controller is informed to close the gate (7). When a car leaves the parking lot, the driver has to pay the parking charges first. On the Payment Terminal, a person can select the appropriate license plate of their car and select pay. A message is then sent to the IoT Hub initiating a request of payment (1). Application service calculates the price and sends it back to the Payment Terminal (2). When the Payment Terminal receives the payment credit, it sends the information to the IoT Hub that the payment was successful (3). Application service will than send a message to the Parking Controller that the car is about to be removed from the parking lot (4). The Parking Controller starts blinking the Green light. After the car is removed from the parking space, a message is sent to the IoT Hub indicating the removal of car (5). The Parking Controller also opens the gate to exit. After a timeout value, the gate is closed again and a message is sent to the IoT Hub that the parking space is now free. After this, the Public Display again shows the updated information on all the parking lots (6). In the following sample application, I will try and show to you how to communicate with the Azure IoT Hub easily. To understand this sample you need a basic understanding of C#. If you want to build the application, you will need Visual Studio 2015. To run the example, you will also need an Azure account. You will need to create a free Azure IoT Hub and create a device on your Azure IoT Hub. You can use the device explorer to do this. Device explorer documentation can be found here. Here I am going to show you a small example of a server-side application that takes messages from the IoT Hub and processes them. This code is really simple and is not meant for the production environment. It is only to show you how easy it is to communicate with the Azure IoT Hub. In this example, we only receive the message from the device and send new messages back to the same device. You will have to modify the server-side code with your connection string. This will take care of receiving and responding to messages. To use the clients, you need to replace the URL to Azure IoT Hub with your URL. Device.cs. Inside your client you need to create a new Device object and register the OnMessageReceived event. This will allow you to get all the messages sent from the Azure IoT Hub to your device. After the server is ready, you can select “Send Hi” from the client application. In the image above, you can see the client sending “Hi”. After the server received the message from client, it responds with the following message, “Hi from IoT Hub”. As you can see in my sample, it is really easy to communicate with the Azure IoT Hub and send simple messages. For more complex applications, there are many things that can be improved but that also makes the sample application more complex. 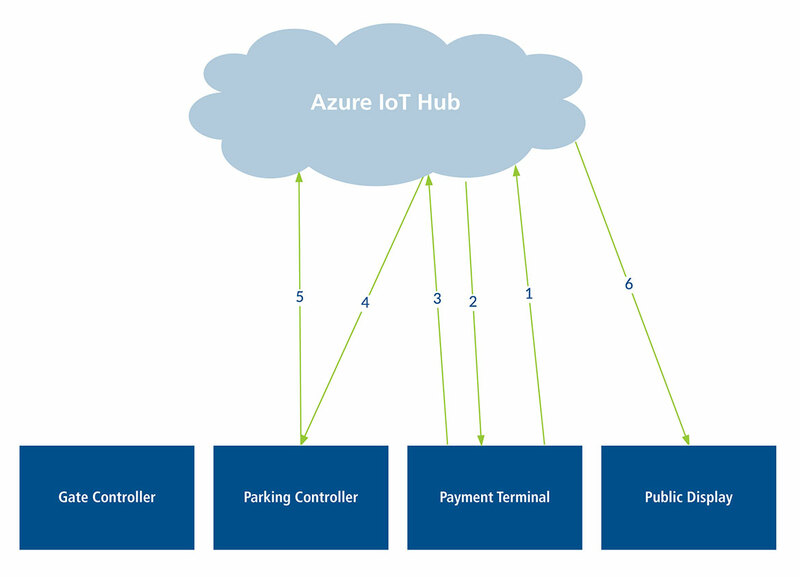 With this sample and explanation, you should be able to develop simple applications using Azure IoT Hub. Also all Toradex modules support Azure IoT Hub. You can read more about the type of support offered by the Toradex modules here. You can also download SDKs for WinCE and Linux.